If you’re looking for a play yard or containment option for your dog that is truly portable, take a look at the Carlson Red Six Panel Portable Pet Pen. 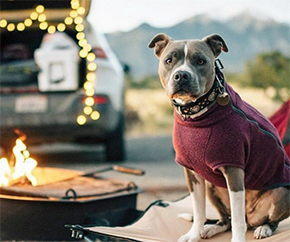 Creating a safe play area for your animals in seconds the lightweight, foldable, pet pen is ideal for at home, when traveling, at the park, or camping. This attractive pet pen is equipped with reinforced mesh throughout and measures 48” wide and 26” high to easily accommodate a variety of dog breeds. For added convenience the portable pet pen includes a small pet door that zips open for easy access. The instant set up of the pen makes it an ideal play yard or containment choice for indoor and outdoor use. The Carlson Red Six Panel Portable Pet Pen is made entirely of steel to handle the everyday use of your pets. Made with a sturdy canvas material, the edges include a reinforced stitching for added security. While the reinforced mesh walls add durability, visibility and peace of mind knowing that your dog’s claws won’t rip through the pen. We know you’re busy, so wasting time assembling products is not an option, especially ones for on-the-go use. To keep it simple, the fully assembled portable pet pen is designed to set up instantly and fold down compactly with a single motion. Set up is as easy as pulling it open, pushing down on the foot lock and putting your pup in to play! It’s that simple. 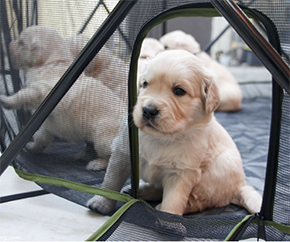 Whether you’re at home, at the park, traveling, or visiting friends and family, the Carlson Red Six Panel Portable Pet Pen is perfect for play and containment indoors or outdoors. The lightweight portable pet pen measures 48” W and 26” H. Accommodating a wide variety of dog breeds, the pet pen has ample room for your dog(s) to move around. The go-anywhere pet pen folds to a fraction of it’s size and slides into the included carry bag with strap for superior portability. 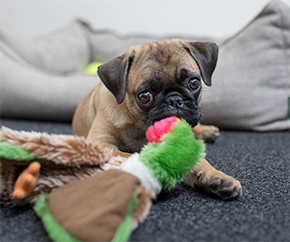 Because we know your travels take you indoors and out, the portable play yard is made from reinforced mesh and water resistant material to keep damp grass or dirty puppy paws from making a mess. The water resistant nature of the yard also makes clean up simple. Wipe down the play yard with a damp cloth and soap to keep it fresh and sanitary. The Carlson Red Six Panel Portable Pet Pen is backed by a manufacturer’s limited 90-day warranty. Carlson’s products are designed specifically for your pet and suit all breeds and lifestyles. Having a dog can be a lot of work at times. You are responsible for their well-being. However, that doesn’t mean there aren’t ways to make caring for your pet more efficient - here are some tips. The two most challenging issues I faced with a new puppy were crate training and potty training. At some point in your pet-owning journey, a professional is sure to bring up the topic of pet insurance with you. We’re diving-in to provide answers to all of the questions we had when determining if we needed pet insurance.